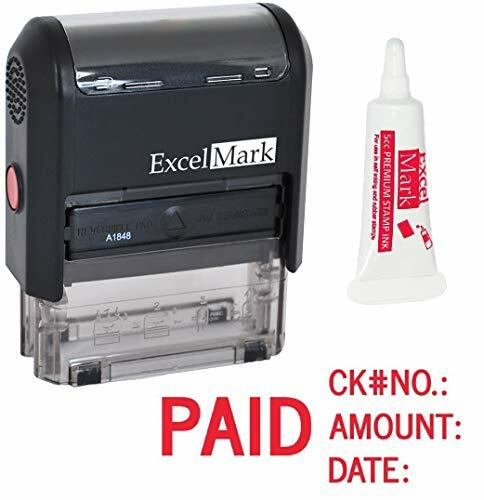 Stay organized and ensure efficient communication with the use of this "Paid, Check No., Amount, Date" self-inking rubber stamp from ExcelMark. The self-inking design automatically re-inks itself into a rotating, self-contained ink pad before each impression, making it ideal for rapid, repetitive stamping. In addition, the two-sided ink pad gives you double the life. When the impression starts to fade, simply slide the pad out, flip it over, reinsert and keep stamping! Stamp impression: "PAID" with "CK#NO. :" "AMOUNT:" and "DATE:"